Abhinav has done it. He has not only done shooting, Chandigarh, Punjab and India proud but also carved a name for himself in the history books by becoming the first ever individual to win an Olympic gold for India. 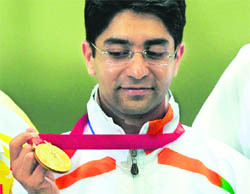 Surprise and ecstasy marked the instant reaction of the city on the unique achievement of the local lad, Abhinav Bindra.. His “bulls eye” in the 10-metre air rifle shooting finals at the Beijing Olympic fulfilled the dreams of the nation of a billion but for Chandigarhians it was a special moment that they’ll never forget. President Pratibha Patil, Prime Minister Manmohan Singh and leaders across the political class today hailed the gold medal winning feat of shooter Abhinav Bindra, saying it would be an inspiration to youths to take up sports as a full-time career. 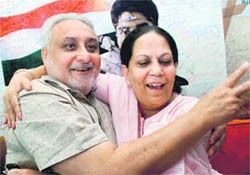 Are political parties exploiting the Jammu situation? bringing honour to the country. For a shooter who did not betray his emotions even after scaling the pinnacle of Olympic glory, Abhinav Bindra’s nerves were not always made of steel. Perseverance and the right guidance created the Olympic champion who in his initial phase of training was prone to self-doubts about his abilities. At least four persons, including Hurriyat Conference leader Sheikh Abdul Aziz, were killed and about 100 policemen were injured in firing as thousands of people took out the “Muzaffarabad chalo march” towards the LoC in protest against the “economic blockade” of Kashmir today. The impeachment process would be completed by September 3, information minister Sherry Rehman told reporters here on Monday. Sherry talked to mediapersons after a meeting of the special committee that is drafting the charge sheet. The committee met amid intense political activities in the capital while political circles awaited a decision by President Musharraf to step down.